WHICH MASCHINE IS FOR ME? 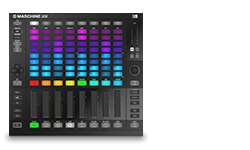 Perfect for Beatmakers who look for a powerful centerpiece, to produce directly from one unit with easy access to editing and mixing features. Quantize, Nudge, Copy, and control audio inputs with dedicated buttons. Producers who want an all-in-one system, including ultra-sensitive pads, 2 color screens; plus the benefit of recording and sampling without the need of an extra soundcard. New to hardware and want a device to play and produce that perfectly integrates with your DAW. 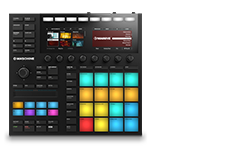 Its small size, portability, and unbeatable price make it the perfect entry point into the MASCHINE world. 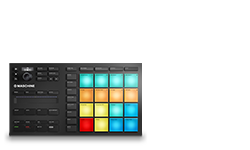 JAM’s click-pad layout is perfect for step-sequecing and performing music. Instanly build up beats, launch patterns, and play with the eight Smart Strips for added creativity. 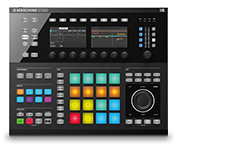 Jam is also a perfect addition to any other MASCHINE systems. Smart Strips N/A 1x horizontal Smart Strip for strumming notes, pitch bending sounds, performing with FX, use the lock-feature and more 1x horizontal Smart Strip for strumming notes, pitch bending sounds, performing with FX, use the lock-feature and more 8x vertical Smart Strips for creative real-time performance and composition. Strum and bend sounds, mix, create complex effects bursts, use the lock-feature and more. Footswitch "2 x footswitch inputs (Start/stop, record, sustain, expression)" "1 x footswitch input (Start/stop, record, and automatic detection for sustain/expression)" n/a "1 x footswitch input (Start/stop, record, sustain, expression)"
No. of Groups Unlimited in software, 64 accesible from hardware. Unlimited in software, 64 accesible from hardware. Unlimited in software, 64 accesible from hardware. Unlimited in software, 64 accesible from hardware. No. of patterns per scene Unlimited in software, 64 accesible from hardware. Unlimited in software, 64 accesible from hardware. Unlimited in software, 64 accesible from hardware. Unlimited in software, 64 accesible from hardware. Dimensions / weigh Width: 432 mm / 17.0"
Length: 350 mm / 13.8" Height: 58.5 mm / 2.3"
Weight: 2.2 kg / 4.85 lbs Width: 320 mm / 12.6"
Length: 177 mm / 6.96" Height: 45 mm / 1.77"
Weight: 1.12 kg / 2.47 lbs Width: 320 mm / 12.6"
Length: 295 mm / 11.6" Height: 30 mm / 1.2"